Five bidders battled it out for the Camden Square property when it went under the hammer in Piccadilly on Monday, auctioneer Chris McHugh said. The semi-detached house where the 27-year-old musician died failed to sell after it was put up for sale for £2.7m in May by Winehouse's family. "I think they are pleased they have drawn a line under it." Mr McHugh said. The house had remained unoccupied. "They did have it on the market but they didn't get the result for them," said Mr McHugh. The auction catalogue made no reference to the former owner of the three-bedroom house. But according to Mr McHugh "the word got out" and there were four serious bidders in the room and one on the telephone and many more had viewed it. 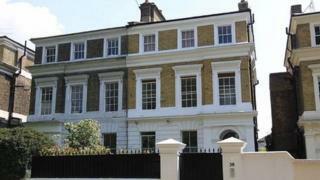 The bidding started at £1.7m and surpassed the £1.8m guide price to reach what the auctioneer said was a "fairly common" price for houses in Camden Square. The singer's body was found at the house on 23 July 2011. Her body had an alcohol content at more than five times the drink-drive, the subsequent inquest heard. The coroner recorded a verdict of death by misadventure. Winehouse's fans turned the square overlooked by the house into a shrine in the days following her death.